Hitler seized his chance in a country in turmoil. He said: ‘If you vote for me I’ll get you this and I’ll do that’. People had no idea that he was preparing himself for war and to occupy Europe. They just wanted food and prospects for their families. When the war broke, he eagerly volunteered for the Germany army. People say ‘why?’, but when you are a young boy war seems like an adventure. Then, when you’re involved in fighting it’s very different, you see all the horrible things that happen, the death, the bodies, the scariness. You can’t control yourself. Your whole body is shaking and you’re making a mess in your pants. While he initially underwent training to become a radio operator, he proved less than adept at the tasks involved and switched gears to become a paratrooper instead. However, that October marked the eighteen year old’s first experience with the brutality of Hitler’s ideology, and the experience left a mark on him. Trautmann and another soldier set out to investigate gunshots heard in a nearby forest when they stumbled upon a mass execution conducted by the notorious Einsatzgruppen, also known as the SS. After witnessing this, the pair very carefully crawled away from the site. Had they been discovered by the SS, they would have wound up in the trench too. After spending nearly three years on the Eastern front, including being captured by the Russians and later escaping, Trautmann’s regiment was moved west. At this point, he was among about 100 soldiers left in his regiment which was 6,000 strong when it entered Russia. The young soldier who had been awarded five medals, one of which was the Iron Cross (and all of which he would later toss in the garbage), for his acts during the fighting was shipped to England to the POW camp at Kempton racecourse, and then transferred to Camp 180 in Northwich, Cheshire. However, a problem arose in the camp, not so much from the POW’s towards their captors, or vice-versa, but rather between the Germans. Many of the captured POWs were ardent anti-Nazis, while others were Nazi to the core, and then there were those in-between. Needless to say, these groups didn’t get along well and things came to blows regularly. Thus, the British had to divide them up, separating them based on political opinion. The groups were, Group A: anti-Nazis; Groups B: those who were more or less politically neutral; and Group C: those who were thoroughly indoctrinated with Nazi ideologies. At the same time he was learning to let go of Nazi ideology, he also played soccer in his free time, a hobby he had since childhood where he’d once been given a certificate of athletic excellence signed by the president himself. The twenty-two year old quickly became a star on the field at the camp. He played as a centre-half until his teammates convinced him to switch to goalkeeper after he suffered an injury. After being released from the POW camp in 1948, Trautmann decided against returning to Germany, instead remaining in Great Britain, working for the government disposing bombs. He also continued to play goalkeeper on the semi-professional St. Helens Town team. Word quickly spread of his talent, and the professional soccer team of Manchester City Football Club offered him a position in 1949. But having a former highly decorated German soldier on the team didn’t sit well with the public so soon after the war, particularly among the Jewish populace. A crowd of more than 20,000 people protested outside of the stadium and letters arrived that derided the team for signing a former member of the Luftwaffe. Of course, it helped that he was exceptional at his position. For instance, in his first match in London, he was initially booed and called all manner of names by the crowd. However, after making several truly outstanding saves during the match, at the end of the game he received a standing ovation, even from the opposing team who applauded him along with the crowd as he walked off the pitch. He went on to play in over 500 games for the organization over the next fifteen years and is generally considered one of the greatest goalkeepers in the history of the sport, and the first of that position to ever win the FWA Footballer of the Year Award, which he accomplished in 1956- the same year perhaps the most well-remembered event of his career took place. The incident in question took place on May 5, 1956, during the FA Cup Final between Manchester City and Birmingham City. In the second half of the game, the score stood 3-1 Manchester City. 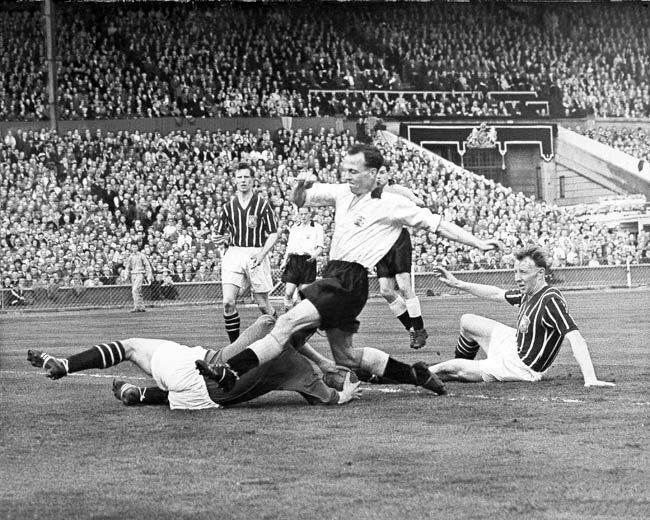 Trautmann was guarding the goal when an opposing player, Peter Murphy, attempted to score. Trautmann dove for the ball and ended up with Murphy’s knee connecting behind his ear. Despite this “fog,” he managed to make several critical saves in the last minutes of the match, saving the game for Manchester City. During the medal ceremony after the game, Prince Philip noted to Trautmann that his neck looked crooked, but Trautmann gave little thought to the matter and even attended the banquet after, despite the pain in his neck and that he couldn’t turn his head. The next day, he did go to see a physician, who told him it was nothing to worry about, and just a crick in his neck that would resolve itself in time. But the pain continued and was so severe that three days later he decided to get a second opinion. That’s when an X-ray revealed that he had five dislocated vertebrae, one of which had completely cracked in two. The only reason he had avoided being paralyzed and possibly killed after the initial kick and as he dove around later in the game was that one of the other dislocated vertebrae had wedged itself tightly against the broken one, preventing the two broken pieces from moving. Trautmann continued to play after healing from the injury, finally retiring as a player in 1964. Among other awards he received in his lifetime, the significant role he played in normalizing British and German relations after World War II led to Queen Elizabeth II appointing him an “Honorary Officer of the Order of the British Empire” in 2005. He died eight years later at the age of 89 at his home in Spain. Al Jolson- Misunderstood Hero or Villain?